To provide the highest quality martial arts instruction in the area at an affordable rate with an emphasis on developing leadership qualities in the students through the teachings of Tae Kwon Do. World Karate, offering the finest Martial Arts instruction in Fairfax, Annandale, Burke and West Springfield. World Karate is a great place for the entire family to realize and acheive their martial arts goals. 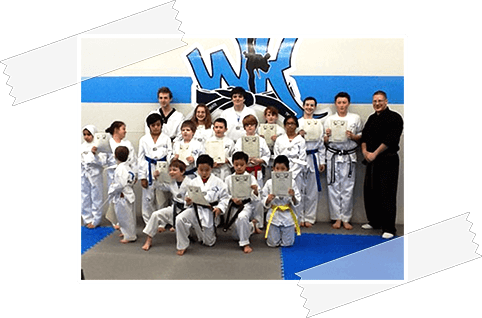 World Karate has been serving Fairfax, Annandale, Burke and West Springfield for over 20 years, has taught over 5000 tae kwon do students and nearly 500 have reached the level of Black Belt. World Karate also provides other fun and learning activities such as After-school programs and annual Summer Camps. World Karate is also a place of fitness with its Boot Camp Kickboxing Program. Martial Arts as taught by WK, will help alleviate stress and pressure caused by everyday routines. Parents want their children to grow up to be strong, healthy, do well in life and become more physically fit. World Karate does not advocate the aggressive use of Martial Arts. We help channel their energy in a positive manner. World Karate offers programs to fit most budgets and needs and starts all students in our Quick Start Free Trial Program. World Karate is known for having a quality staff. Each WK Black Belt Instructor has earned his/her Black Belt through WK. As an industry leader, World Karate stays on the cutting edge by teaching Tae Kwon Do in a highly practical manner.